In the wake of Constitution Day, there is a truly depressing survey by the Annenberg Public Policy Center that found that 227 years after the signing of the Constitution only 36 percent of Americans can actually name the three branches of government. Thus, 64 percent of Americans cannot name the three parts of our tripartite system. The same rough percentage (62 percent) was unaware that the GOP controlled the House of Representatives and 17 percent actually thought that the Democrats were in control. The same percentage — only 38 percent — knew that Democrats controlled the Senate. Some 20 percent thought that the GOP controlled the Senate. The situation is even worse with regard to the details of Article I. Only roughly a quarter knew that it took two-thirds of a majority of both houses to override a presidential veto (27 percent). Only 15 percent could identify the Chief Justice of the United States while, in a truly depressing comparison, 27 percent knew Randy Jackson was a judge on American Idol. That is a chilling result 227 years after the signing of Constitution, but that is not likely to concern most citizens since only 13 percent knew the Constitution was signed in 1787. As discussed earlier, the problem is not unique to the United States as similar surveys in Germany and England have shown. This is the result of years of neglect of the civics training in our country from elementary high schools. 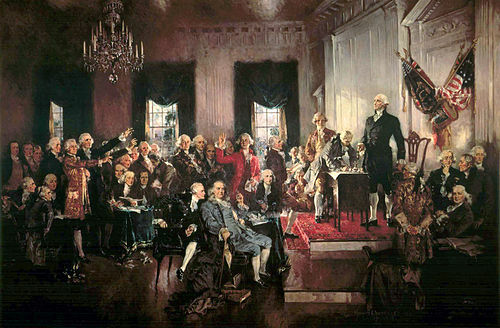 We need a return to basics in our schools, including our constitutional history and values. Americans are fiercely proud of their country but many know relatively little of the key characteristics of our system or its history — the very thing and defines and binds us as a people. The three branches of US government? There is the torture branch. And finally the warfare branch. I can just hear all the JIM CROW cries now. You were right rather than answer they were deleted…. Paul, JT is a Cub fan. And like many, he is very intelligent. But, you get to see a lot in your area during Spring Training, so I’m sure you have your own opinion. The people who sit in the stands @ Wrigley are most high achieving Yuppies. They are more Wrigley networking fans than Cub fans. I actually had an opportunity to observe JT @ a ballgame this year. He sat behind home plate w/ his son @ a Cub/Nat’s game. So the camera was always on him. I didn’t count beers. He is a real fan. He watches the game intently, unlike the aforementioned yuppies. He probably doesn’t have that self loathing many Cub fans have. But, I’m just giving him the benefit of the doubt since he’s a real fan. The only baseball you hear from the Yuppies in the stand is self pity for being Cub fans. NOBODY IS HOLDING A GUN TO YOUR HEAD!! But, I rant. Sorry. Nick – I have talked to Cubs fans and I do not understand the culture. And I think it is a culture. There is no real reason for someone to be a Cubs fan. Yet, they are. It is like asking to be mentally tortured, yearly. I see the same thing with the Arizona Cardinals. St. Louis was glad to get rid of them. I heard some people helped pack their bags. I would would do the same now, except they are on the other side of a very big valley and I would not go out of my way for them. Thank you for that post David. Well done! Paul, I tried to respond to you about the Declaration of Independence being positive law, but WordPress was being disagreeable. Perhaps a moderator will free it for us. david – I look forward to your comment getting out of WordPress hell. When I first joined this blog I quoted original sources and was rightly skewered for the same thing. Since I was on the conservative side, the call for “my” own opinions came from a chorus on the Left. That chorus is curiously quiet now. I don’t participate in these blogs to stroke an ego. I really want to learn from both sides of this debate. I simply don’t understand the point of participating in a blog if you are not interested in intellectual honesty. People must really need friends more than knowledge. Exactly. Just plastering the comment section with quotes and then having NO commentary on what you interpret from the quote is useless, boring and frankly leads one to consider that the poster doesn’t actually have any thoughts of their own. In a discussion, quotes and substantiating evidence are important to buttress your argument, but they can’t be the sole argument. I am more interested in WHAT the participants in the discussion think, how they arrived at their conclusions. Just parroting the thoughts of other people with no insight into your own thoughts is a very weak way to argue your point. If you have a point articulate it yourself. Actually, It’s fair the Cubs don’t win because then their fans would lose the comfort of victimhood. You see the joy some here find casting themselves as victims. Most folks don’t get it but they do. There are also the victim enablers. They point out the unfairness and apparently also find joy in that role. The Red Sox had the same dynamic, but no more since they’ve won. So, Cub fans are even more comfortable in their victimhood, holding that special place solo. No, Paul, it would be unfair to take away that from Cub fans. It’s what makes them special. Nick – Cubs fans are ‘special’ in that they get to ride the short bus? But then again this is not a free speech site any longer…. Scalia is the mark to be measured by. It appears you’re being uncivil towards annie.